But you and I don’t live under the Old Testament law. We don’t offer animal sacrifices. We don’t generally feel compelled or even inclined to get down on our knees or on our faces. In fact, most of us would find it a little weird, at least at first. Viewed against the apparent formality and religious stuffiness of the Old Testament, it’s not surprising worship as a lifestyle appeals to some. 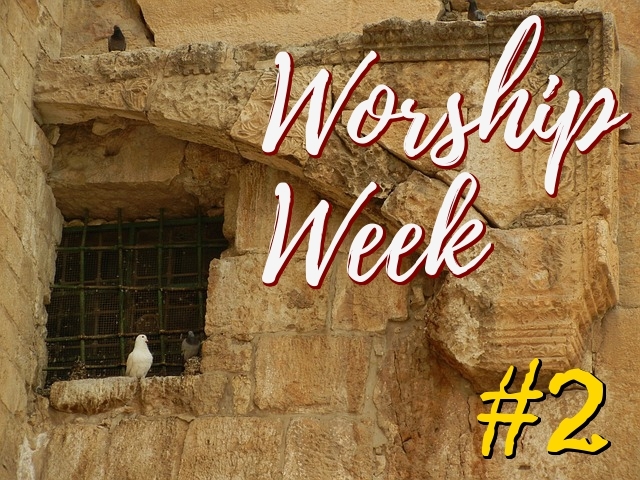 The idea of worship as a lifestyle rather than a specific activity to which one deliberately devotes oneself is derived primarily from the teaching of Romans 12:1. The words translated “reasonable service” in the venerable King James Version are also legitimately rendered as “spiritual worship”, “reasonable worship” or “appropriate worship”. The inference drawn from that term is that the sort of worship commanded in Old Testament times has been eclipsed, outmoded, and done away with. Now to be fair, presenting our bodies, for all that Mr. Piper makes of it, is only one among a number of sacrifices — or acts of worship — that ought to characterize the life of the believer. Witnessing about Jesus Christ is “the priestly service of the gospel of God”. We ought also to “continually offer up a sacrifice of praise to God”. Even doing good and sharing are referred to as Christian “sacrifices”. Old Testament language like “priestly service” and “offer up a sacrifice” should be an indicator to us that worshiping in spirit and truth is not some brand new thing disconnected from or utterly different in character from genuine worship in Israel. Well, the place of worship has changed. The Samaritan woman said, “Our fathers worshiped on this mountain, but you say that in Jerusalem is the place where people ought to worship”. She was caught up in the “where”. But the Lord answered “neither here on this mountain nor in Jerusalem”. We worship in spirit and truth. We are free to worship at all times, in any circumstances. The acts of worship have also changed. Not only the “where” but the “how” of worship are different. We do not present animal sacrifices. Instead, we present our bodies as living sacrifices. We witness, we praise, we do good, we share, we sing, we testify verbally. But even though some external things about worship have changed under the New Testament economy, its characteristics have not changed. Worship is still to be deliberate, sacrificial, obedient and informed by the character of God himself. It is still not a mechanical, rote act; is it still not to be engaged in casually. This is demonstrated in what Paul refers to as “the Lord’s supper”. Those who ate the bread or drank the cup of the Lord in an unworthy manner became weak and ill, and some died. The “unworthiness” for which the Corinthian believers were judged is just the sort of unworthiness so frequently on display in Old Testament times. The worshipers failed to judge their own hearts. They were casual about their worship. Their gatherings had become routine rather than a conscious act for which they prepared themselves. And we dare not become casual about the worship of God. I see several dangers in congregations where the idea of worship as a lifestyle has taken root. One thing that seems to me potentially dangerous in the idea of worship as a lifestyle is the shorthand John Piper inevitably employs even in describing it, shorthand that has been picked up by those who have embraced the idea, and that is becoming impossible to escape. “… chastity is worship. Continence magnifies Christ above sexuality”. No, sorry. That’s not correct. The desire to be pithy, perhaps, has caused Mr. Piper to perhaps inadvertently express an untruth. Chastity CAN BE an act of worship. Ideally, chastity SHOULD be an act of worship. It can also be a grumpy, regretful exercise in self-control. It can be fear of rejection. It can be a sense of duty to religious regulation. It can be respect for your parents. It can be fear of the judgment of God. It can be a phobia. It can be lots of things. In fact, most of the time, the act of remaining consciously chaste is anything but worshipful. Did you think about the Lord Jesus with reverential awe the last time you dragged yourself away from a tempting situation? Good on you if you did, but I’m guessing you had other things on your mind. More shorthand, from the platform at a Bible conference: “Let’s stand and worship together”. Hey, nice aspiration. But that’s all it is. We’re going to stand, sure. Most of us will sing. Some of us will think about football, and some of us (probably the younger ones) will think about the girl one pew over. Some of us will get derailed by typos in the lyrics on the overhead, or wonder why the writer sometimes says “thee” and two lines later employs “you”. Okay, that last one was me. No worship occurred, I regret to say. Singing is an act of worship that CAN give rise to real worship, but it’s not the mere activity that makes it so. More shorthand: “We’ll ask the worship team to lead us in another song”, whereupon we are treated to a musical performance from a guitarist and his wife. This time the congregation does not even participate. No, stop. Please stop. Cut it out before I choke on the sanctimony. Perhaps the lady was singing worshipfully; I have no way to know and neither did the man introducing the duo. I have no objection to being reminded to sing worshipfully myself (when given the chance to sing at all), but please don’t dignify a perfectly ordinary song about personal feelings with the label “worship”. It was a performance. If an attitude of worship was encouraged anywhere in the building, that’s a great thing. Again, the act of singing is in and of itself meaningless. Such spiritual shorthand is confusing and misleading to a new believer. It misrepresents the gravity and distinctiveness of worship. Another danger of indiscriminately using the word “worship” to apply to anything and everything in the Christian life is the very palpable risk of coming across as a bit pretentious. I can’t help it; every time somebody uses “worship” as a spiritual buzzword (much like the term “faith tradition”), I find myself wanting to shout, “Really?” Christian sloganeering inspires in me the same sort of visceral distaste I experience over a new bit of corporate jargon in the workplace: “pushback”, “going forward”, “right-sizing”, “reach out” and so on. Do we really need to trivialize worship that way? Even worse than sounding pretentious is the danger is of actually becoming pretentious. One worship-as-lifestyle advocate describes himself on his website with the words “Worship Pastor and Composer”. Yes, with initial caps, just like I typed it. By this he means “I encourage people to worship and I write articles about it”. Okay, fine. Why not just say that? Or … is it cooler to have a title? We may well be worshiping. We certainly hope that we are. But there is no need to label it and every danger that in doing so we might label it falsely. We may be ascribing a dignity to an activity that is not worthy of it. We recognize that it is good to undertake everything we do in a spirit of reverent fear for God and consciousness of his presence. This is not disputed. We might say that everything in the Christian life is best done when it is done worshipfully. But the bottom line is this: if “worship” is employed to describe everything in the Christian life, then it no longer specifies anything in particular. Which means that “worship” is nothing. It is language without content. When you see it that way, it’s no surprise that the actual practice of worship is deadest in congregations where the word “worship” is interpreted most broadly and non-specifically. In such gatherings worship is often highly lauded and talked about a great deal. But they don’t know what it is. This may be why the Lord’s Supper is reduced to a fifteen-minute thing once a month in many local congregations or community churches, or eliminated altogether. The deliberate act of setting apart an occasion to think on nothing but the greatness of God and our debt to him paid through the Lord Jesus is not something they remember to do at all. After all, everything we do is worship, right? We are not, like Old Testament worshipers, engaged in offering tangible, physical offerings on an altar. John Piper is right to observe that New Testament worship is in its very nature spiritual. But the fact that we worship in spirit does not inoculate us from pride, indifference or self-sufficiency any more than the Israelite worshipers were preserved from those errors. Labels, the use of spiritual shorthand and forgetfulness about the real meaning of worship in our gatherings are, to my mind, red flags; warning signs that we are in danger of slipping into the same patterns of thinking as the Israelites in the time of Isaiah. We need to be very wary of making that mistake. By all means worship, and at all times if possible. But the Lord is the judge of what constitutes worship and what does not. Regardless of what we call it. I am continuing the comment thread started in part 1 over here in part 2. I completely understand what you are saying about worship but belief we are coming at the same thing from a somewhat different perspective and emphasis. To use a military analogy, you already have advanced to the higher ground with heavy weaponry while I am currently more interested and involved with bringing up the rear where there is a lot of sniping, ambush, and danger of getting wounded and killed. In that environment, which I consider to be the messed up part of the world, there is little opportunity or inclination yet for the formal type of worship, which you hold out as the appropriate manner in which to approach God. True worship has to be based strictly on love. You cannot in truth worship that that you do not love. That's why we say about a young couple to be married he/she worships the ground she/he walks on. They are enamored with the beauty, demeanor, temperament, caring, strength, personality of the beloved. Things have therefore indeed changed in the world when Christ, the purest distilled essence of love, arrived at the scene to be loved in turn and worshipped as a natural consequence of that love. God fully understands what is going on in the rear guard and he came to bind up wounds and to save. Take the parable of the vineyard where he hires laborers at 5 pm but in his generosity pays a full days wage. Or, the wayward lost son returning because only the father has the means to pay off all his incurred debt and he dares to start trusting again in the love that a parent has for his children. Or, where God promises that he will not quench a smoldering bruised read. Or, the thief on the cross where God even pays a full days wage for working only 20 seconds. That is what elicits the very start, the beginning of worship, the infancy of worship, when that person for the first time, or once again, turns towards love incarnate in prayer and opens themselves to be loved in return. This is clearly what God desires and which made him lay down his life for us. And yes, I absolutely know that you know that as well but, as I said, we are talking about early vs mature stages of worship, but worship nevertheless. Thanks Q. Appreciate those thoughts. When I get home from work every day, my cat climbs on my shoulders and worships (or at least the feline equivalent thereof). It's not about getting fed; she's already had plenty to eat. She's not really asking for anything except to be close. And she's really not terribly articulate: she can purr and that's about the extent of it. But for 10 minutes she lets me know she's glad I'm around again before jumping down to get back to something more conventional like chasing spiders or snoozing. So I'm all for people bringing the best they've got, even if there's not a whole lot to work with. I get your point about the infancy of worship, and infant worship is wonderful -- from infants. My concern -- and you obviously get this -- is that there are those who have been Christians for years and have little or no idea about giving back TO the Lord. They have lots to say about how the church should be run, lots to say about how this or that passage should be correctly interpreted, and they're often quite active in service of some sort. But they never take the time to condition their hearts with the word of God and reverently approach him with anyone other than a string of requests. If the Internet is evidence of anything, it's evidence that Christians have lost the idea of what worship really is. And if you don't even know what something is, how do you mature in it? And this is where I'd like to strongly encourage believers who have known the Lord for some time to give serious consideration to that aspect of the Christian life. :-) Where can you buy one of those worshipping cats?